Camping in Alaska includes places to camp, campsite information and where to go Camping in Alaska. We're passionate about camping in Alaska from back country remote tent campsites to private RV parks where all the comforts of home travel with us in the family RV. Not always are the roads less traveled going to offer you a more exciting or enjoyable vacation and often here in Alaska it can be just the opposite. If you’re planning to visit Alaska and plan on doing so camping while doing so than the all new Alaska Campgrounds website is the place for you. In part due to the immense size Alaska, it’s very important to have a plan before you arrive as the diversity of Alaska is unlike any other place you have been. From formidable coastlines with intriguing secret fjords to mile high glaciers where snow camping is possible 12 months through the year, you're destined to discover the campsites you've been daydreaming about. Learn about the most exciting destinations, favorite activities, most scenic sights and of course the best in Alaska campgrounds. Follow along the “Circle of Discovery”, the same roads traveled by the tour busses from Holland America and Celebrity cruise tours. We will add clarity to the confusion on visiting the 49th state from the many campgrounds and RV parks in Alaska. Want to see the widest verity of Alaska sights and experience the best of Alaska's magnificent scenery? Take a trip around the Circle of Discovery where you will sample the widest variety of Alaska's best sites. See Mount McKinley, Denali Park, Fairbanks Alaska and the Alaska Pipeline. Stop at the North Pole and shop for souvenirs in Santa's Workshop. This journey covers over 1200 miles with the options to add even more. In the next section we list the roads and their distances with links to pages about each option and how it fits into the Alaska vacations journey. Also included are the campgrounds and RV parks for you to plan that Alaska camping trip in advance of your arrival. The Circle of Discovery begins the moment you enter Alaska. Assuming you're entering from the Alaska Highway, the route takes you through miles of rolling tundra dotted with beautiful lakes and meandering streams. Choosing your route around Alaska really isn't as difficult as it could be. Alaska Highway - 110 miles - Beaver Creek Yukon to Tok Alaska. 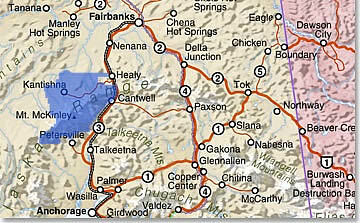 The Taylor Highway continues another 79 miles from Jack Wade Junction to Dawson City Yukon. At this point the road is known as the Top of the World Highway. Soon to be included are the sections continuing from the Taylor Highway traversing deep into the Yukon Territory of Canada. Poker Creek Alaska. The most northerly land border in the USA. Population 2. Camping in Alaska just wouldn't be complete without a few bears and a moose or two. Get up close with nature, enjoy a canoe ride around some remote wilderness lake or down a stream chocked full of Alaskan salmon and char. Take a side trip up and over the Top of the World Highway — the Taylor Highway is one of Alaska's most scenic drives. The Richardson Highway follows alongside other intriguing lakes, rugged mountains capped with ancient glaciers, stands of birch and pine and the occasional grizzly bear, caribou or moose is common to see. Keep your cameras handy and your batteries charged as things are about to get really interesting. Listing with our picks for Alaska Highway Campgrounds & RV Parks: Updated for everyone driving to Alaska on the Alaska Highway.